A very short post to let you know I’ve just begun working on new music! The very early stages of working on a new album are some of my favorite moments in the album-making process: I usually know where I want to be headed, but there is a world of difference between audio daydreaming and tangible sonic reality. So it’s a thrill to install new pieces of gear and get the first feel of how simultaneously challenging and fun the exploration of sound is going to be: everything still needs to be understood in depth, tested in all possible combinations, until slowly, those sonic glimpses start to gel into actual music. 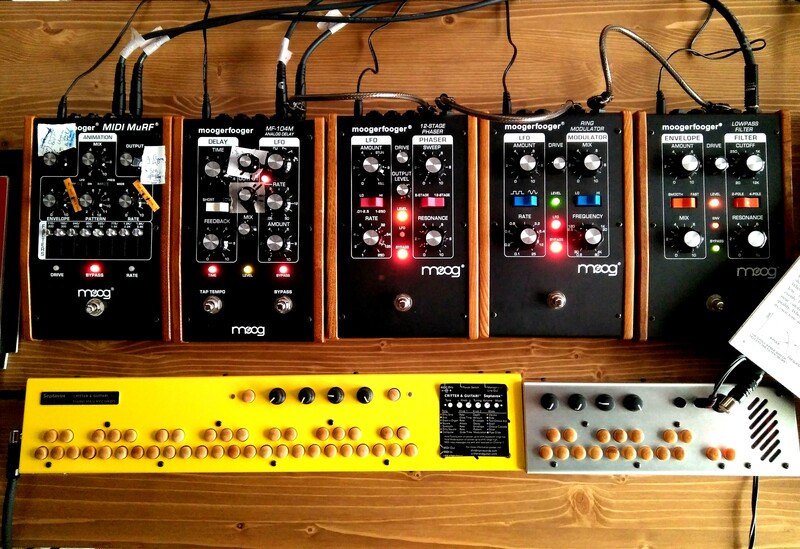 This is only part of the setup I intend to use, and there’s already so much to explore in there: whenever I see those 5 Moogerfoogers together, the French expression “brochette de Moogerfoogers” (“Moogerfooger skewer”) comes to my mind! You are currently reading WORK STARTS ON LP7! at colleen.